Early Half Dimes are silver five cent US coins also referred to as a half disme (pronounced deem). They were first made in 1792. This was the year before the first United States Mint actually opened for business. They were official US coins, however. This is the machine used to produce the actual coin. It can be a machine press, screw press or hammer press. that would soon be in the first official U.S. Mint. John Harper was a Philadelphia saw maker who had connections to the Mint. Were These Coins Made From Silverware? It is rumored that President George Washington was so eager for the United States to have its own coins that these early pattern coins were made from his own silverware. Why Weren't They Called Nickels? It may seem strange to you that they are called half dimes instead of nickels, but the term nickel is a slang term for coins that are made of nickel. The first five cent nickel coin was made in 1866. It was the Shield Nickel. However, other coins had been called nickels or Nicks before this, but they were not five cent coins. They were just given that slang name because the metal they were made of contained nickel. These are the Flying Eagle Cent, the Indian Head Cent, and the Three Cent Nickel. The US Mint Struck Silver Half Dimes From 1794 Through 1873. All design types of the Early Half Dime were minted at the Philadelphia Mint as it was the only United States Mint at the time. Therefore, these coins have no mintmark. 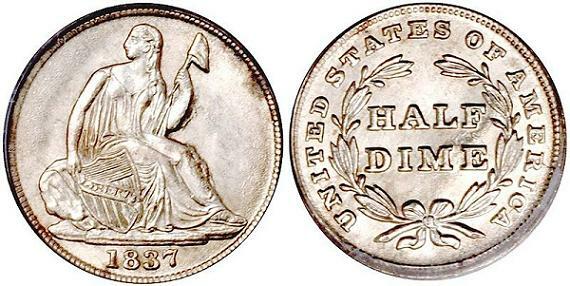 The Seated Liberty half dime was minted at New Orleans and San Francisco as well as Philadelphia, beginning in 1838 for New Orleans and 1863 for San Francisco. This term when used in coin collecting describes a prototype of a proposed coin design. coins or regular circulation issue. About 1500 were made and many of them did make it into circulation. All of these 1792 coins are considered rare and valuable as only 200-250 are known to still exist today. They are one of the United States most historical coins. The edge of a coin with grooved lines around the perimeter. It is also known as a milled edge. The 1792 early half dime pattern issue is also known as the Martha Washington half disme. Rumor has it that Martha Washington may have been the model for this coin. The Flowing Hair half dime holds an important place in United States history as being the first official silver coin produced at the Philadelphia Mint. All early half dimes with the flowing hair design are considered to be rare. The Flowing Hair design was not widely accepted. This may be one reason for its short life span. The eagle was criticized as being too 'scrawny' and Lady Liberty was considered to be less than ladylike with her 'fright wig'. The 1796 half dime has 15 stars surrounding Lady Liberty on the obverse (front) of the coin - eight stars on the left and seven on the right. These stars represented each of the fifteen states of the nation, including the new states of Vermont and Kentucky. This fifteen-star variety continued into part of 1797. Later that year a sixteenth star was added to represent Tennessee after it was admitted to the Union. Realizing that they could not continue to add stars for each new state added to the union, the number of stars were reduced to thirteen for the last design variety of the year. These stars (seven on the right and six on the left) represent the original thirteen states. Designer Using a sketch by artist Gilbert Stuart, Robert Scot and John Eckstein engraved the dies for this coin. Because of low mintage numbers, these coins are rare and hard to find. They are the most scarce design of the half dime, other than the 1792 Flowing Hair. The low mintage numbers was due to having to close the mint during the summer and fall some years due to outbreaks of yellow fever, especially bad during the years 1797-1804. Several employees of the Philadelphia Mint were lost to yellow fever including Joseph Whitehead, assayer, and Joseph Wright, engraver in 1793. Mint Treasurer, Dr. Nicholas Way was also lost to the disease in 1797. 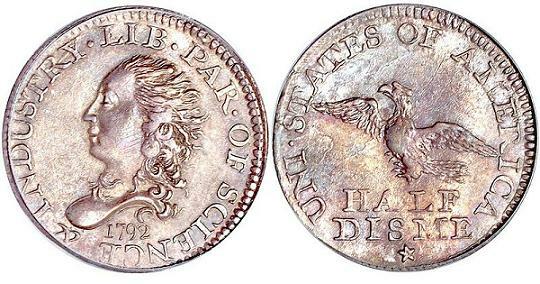 Beginning in 1800, the eagle on the reverse side of the half dime was revised to the Heraldic Eagle. It was patterned after the Great Seat of the United States and was a huge improvement over the 'scrawny' eagle depicted in earlier designs. Except for the 1802, these are usually weakly struck coins. This is a slang term used to indicate the rarest date and mint mark of a particular coin series. with only 3,060 minted. Only a few dozen are known to exist today. There is an interesting coin in this variety to take note of. It was issued in 1800 and has a defective 'R' in LIBERTY. 16,000 1800 LIBERKY half dimes were made. No half dimes were made between 1805 and 1829. Production of the half dime was resumed in 1829 after more than twenty years. The reason for the large gap in production is not known, but it could possibly be that there was a demand for a coin that was larger than a cent but smaller than a dime. At the time, two cent, three cent and nickel coins had not yet been made. These would not appear until the 1850s and 60s. These were the first half dimes to note the denomination on the coin. It was denoted as 5 C. on the reverse of the coin. This brought about the coin being referred to as a half dime or five cent coin instead of the half disme. The basic distinguishing design of a coin. Set of years coin was minted with a specific design and denomination. and since there are no extremely rare dates, a set can be put together without spending a great deal of money. This is another series that would be good for the beginner or budget minded person. There is one exception however. That is the 1870S. Only one of these coins is known to exist. Coin that has been graded and authenticated by one of the third party grading services..
For some great deals on U.S. Bust Half Dimes and other half dimes, as well as Coin Supplies visit my friends at Jake's Marketplace, Inc. They have a very comprehensive selection to choose from and give great discounts!